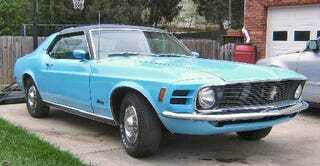 A 1970 Ford Mustang Grande factory ordered in Grabber Blue with a V8 and a 4-speed. And that makes me a bit happier about who’s designing the self-driving cars of the future. He also has a 1970's Westphalia he uses to for family vacations and a 280Z that he’s restoring. He actually bought the Grande because he needed something he could put a child seat in the back of. What a guy. I also “drove” the Hyundai Ioniq autonomous car and it was pretty neat.